The lure of space causes two brothers to make a fateful promise. 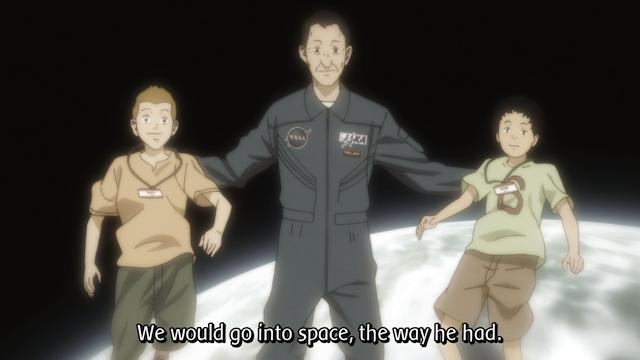 Uchuu Kyoudai (Space Brothers AKA SpaceBros) episode 1 does a great job introducing us to its near future (2025) setting, and to the two brothers whose story we are all eager to see. Though this show is ostensibly Science Fiction, at this point it is really a story of human pathos. Our principal viewpoint character, Mutta, is one of the two brothers who finds himself falling behind, while his younger brother, Hibito, pursues his dreams. Mutta Namba, lost in the middle of life's journey. Where the straight road had been lost. When his supervisor at work insults Mutta’s brother, Mutta loses it. 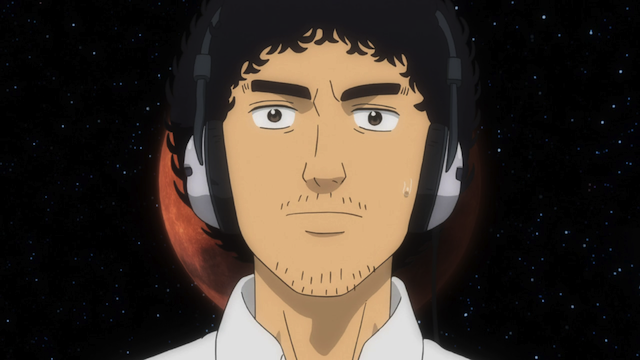 His spirited (violent) defense of his brother, who is on the way to being the first Japanese astronaut to set foot on the Moon, causes Mutta to lose his job, and nobody in his field (automotive engineering) wants to hire him. 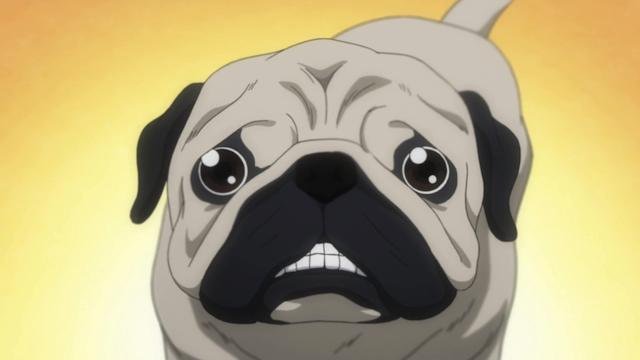 Mutta is living with his parents and struggling. Mutta is a very likable character, and his seiyuu, Hiroaki Hirata, was excellent in a somewhat similar role as Wild Tiger, the aging superhero of Tiger and Bunny. Like Wild Tiger, Mutta is down on his luck. Life seems ready to cast him to the side, a situation he seems to blame on his being born during the Agony of Doha, when Japan lost their first real chance to compete in the World Cup Finals. And yet, like Wild Tiger, Mutta has a sense of idealism. Mutta believes it is his responsibility to be a few steps ahead of his younger brother, even though he finds himself behind. Hibito (left) and Mutta (right) are exhilarated by meeting Mamoru Mohri (center) at the Miraikan. The Namba brothers promised each other that they would both go into space as astronauts. When we are young it is easy to have big ambitions, but as we get older Life seems to teach us that we are never going to amount to anything much. 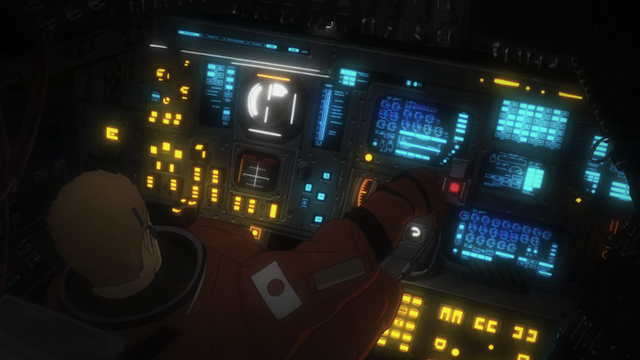 Somehow Hibito kept his part of the promise, and we see him preparing for an upcoming flight to the Moon, where he will participate in an extended stay mission, as an experiment to develop the technologies and practices needed for a manned trip to Mars. Clearly Mutto was as excited as Hibito was when he was young, but he has lost faith in himself. We see that he is a talented engineer who designed some award-winning cars. When the boys go to Miraikan (the Japanese National Museum of Emerging Science and Innovation), Mutta is at least as excited as Hibito to meet Dr. Mamoru Mohri, a Japanese astronaut, who performed experiments on the ISS. Mutta Namba. "I want to go back to dreaming about space". 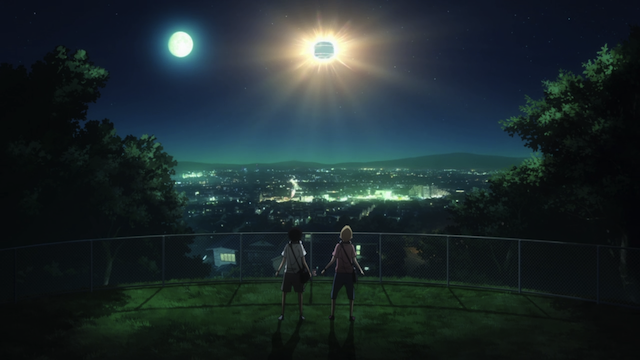 Hibito Namba prepares for space, while quietly supporting his older brother. When their mother lets on that Mutto lost his job, Hibito takes action from afar. There hasn’t been a lot of time to develop it yet, but the relationship between the brothers seems nicely handled. On the one hand, there is clear competitiveness, while on the other, they both care deeply for the other. Mutto lost his job defending his brother’s honor. For his part, Hibito has a secret plan to get his brother back on the “straight road” that he has lost sight of. You know, watching Space Bros did remind me a bit of Tiger and Bunny though I thought it was mainly due to the voice acting of Hiroaki Hirata. I never picked up on the parallels between Mutta and Kotetsu having their midlife crises when they feared losing out on their jobs and dreams. I also didn’t realize the link between the two and their idealistic nature either. 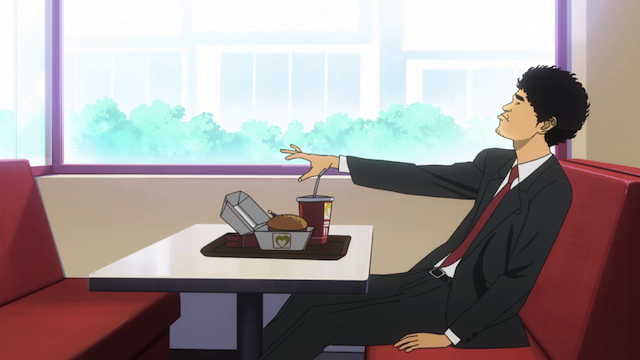 Now that you mentioned those two details, I appreciate Space Bros more than after my first viewing. I’m actually interested to see how long these themes continue for Mutta now that he’s going through with training or if it will develop more into a rivalry with his younger brother (which may or may not be similar to how Kotetsu treated Barnaby). Yeah, I wonder how this show will develop. I read somewhere that there are already more than 50 episodes planned! That gives them a chance to do all sorts of things with it. Yeah, I heard that, too, so I’m curious to see how the next few episodes progress. It could be entirely detail oriented (similar to Mouretsu Pirate’s first few episodes) or it could just be there’s a huge story ahead of us. Either way I’d be happy but 50 episodes is a bit staggering, essentially meaning it will run for an entire year. Still, if it remains as high a quality anime as the first episode suggests, I’d be more than happy to watch this for a year! Unfortunately, the network just updated their website…I guess the previous dates were a mistake or something, and now it’s looking like we’re only getting 13 episodes. WOW. That is a big change . I was getting ready to settle in for a long ride, too. Thanks for the update! So opinion seems to have settled into a vague “Who knows how long this is gonna be?” But I’ll hope for the originally announced 48+. LOL! Well, I guess that’s good news, really. We’ll see what happens, and if they do get a million episodes, I hope they do something good with it. Yes. So far this show is off to a very good start. I like Mutta, and want to see him succeed. another great show that delves into human relationship, this time of two brothers. I love their way of approaching it without any undertone. It is very honest too. I think this show has gotten off to a good start. Of course, every time I say something like that I hear from a bunch of people who think the show in question is boring. Ah well.